Turquoise waters. Sunshine. Endless days. Family. Calm. It’s a quiet Sunday morning and I am laying in bed watching the pilot for the show The 4400 while Skjalg is up mowing his grandparents lawn. We arrived back from Halsa – where Skjalg’s family’s cabin is – on Friday night. Since Kaja had returned to Bodø two nights earlier, we took the bus – which lasted for about 3.5 hours. The original plan was that Kaja would join everyone in Halsa for a day trip, either on Tuesday or Wednesday. That soon changed to include Skjalg and I and an overnight stay. We thought it would be too hectic with 12 people in one house, but it worked out perfectly. Everyone got their space when they needed it and there was plenty to do to keep ourselves busy. We had planned on leaving Wednesday night, to make it back for Kaja’s return flight to Oslo on Thursday, but decided to stay for an extra two days. On Wednesday the entire family took a trip out to Grønnøya (Green Island). It is about 20 minutes away from the cabin in Halsa and is possibly one of the most beautiful places I’ve ever been in my life. Skjalg, Lindsay and I put together shish kebabs for the adults to grill out at the beach. When we got back, Skjalg took the kayak out while I sat out on the shore and knitted – yes, knitted! On Thursday, we did something amazing – climbed a mountain! The mountain is called Helgelandsbukken and is one of the tallest, if not the tallest, mountain in the area. There were five of us that went: Vebjørn, Oystein, Skjalg, Lindsay and I. We were warned that it was a tough climb, but none of us had any idea of what we were in for. It was such an amazing experience! The entire trip took about 11 hours. Lindsay and I went our own pace and ended up stopping at Tåkeheimen, where there is a cabin for hikers to stay at. It took us 6 hours to climb up to that point and it was high enough that we didn’t need to do the last leg. At one point, we had to walk sideways along a rock while leaning in with a straight drop down to the glacier behind us. Today is the first day since the hike that I have been able to move around normally. I’m still sore, but I no longer have to use my arms to move my legs around. Our camera ran out of battery before the hike, but I will get pictures of the hike from the others and upload them as soon as possible. Here are pictures from the trip before the battery died. Believe it or not, I’ve already narrowed it down from almost 300 pictures – everything was just too beautiful! We’ll be heading back to the cabin in about two weeks and I’m crossing my fingers that the weather is as perfect as it was when we were there. 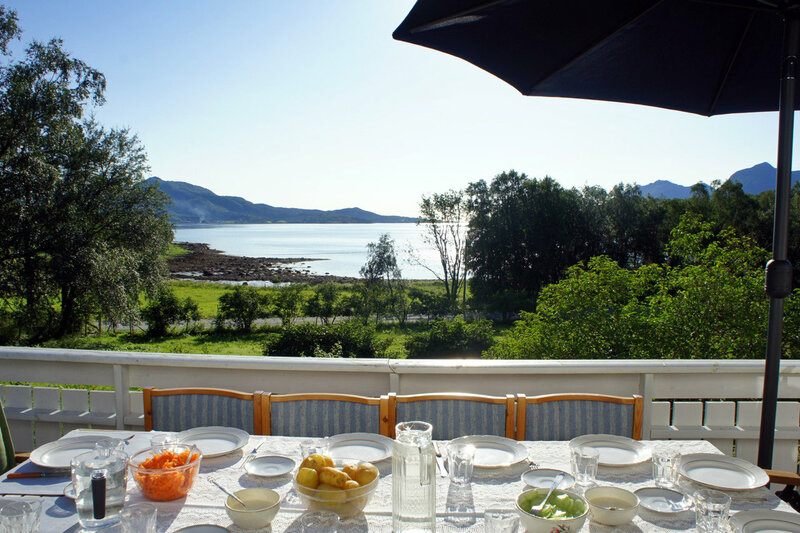 There is nothing like Norway in the summer! View from the gas station on the first leg of our trip – the gas station! It’s pretty much beautiful in every possible direction you look. Øystein, Lindsay, Tore and Grandpa Terje had driven up the day before. Grandpa Terje was there to meet us after the 3 hour drive. Reunited 🙂 Skjalg took this picture. I love it! After we’d settled in, Skjalg and I went out to pick blueberries. The woods behind the cabin had tons of Norwegian blueberries for us. We were out there for almost two hours. Table set for family dinner on the first night – cold white fish with potatoes, carrots and cucumber salad. Everyone kept warning Skjalg to stay close to the shore so that he didn’t tip over out at sea. Everything went fine – no tipping – until he came to shore. As he was coming in, almost the entire family was down by the water – making the perfect audience for his kayak flipping over. When the boys weren’t playing soccer, jumping on the neighbor’s trampoline or fishing, they were keeping themselves entertained by playing Minecraft. For our picnic out to Grønnøya, we decided to make shish kebabs. This was our shish kebab construction station. All the grandkids together for one photo! Øystein’s kids Tore (10) and Lindsay (23) on the left, Vebjørn’s kids Tobias (8) and Matilda (4, almost 5) and then Tord’s kids Skjalg (30) and Kaja (26) on the right. I think this might even be the first picture of all of them together! Beautiful view on the drive out to Grønnøya – look at that water! Finally got to our picnic spot! I could not get over how beautiful it was there. We stopped to take more pictures on the way back home. It was just too beautiful to pass up! Closed out the day with a fishing trip. We passed some goats on the way out to the family fishing spot. Wow! What a place! If winter were only three months long it would be paradise. You are currently reading Cabin by the sea at Buda-B.